EVERYTHING from exam results to breaking university news will be available at the push of a button in the palm of your hand with the launch of Nelson Mandela Metropolitan University’s new mobile app today. With official exam results due on 12 December, thousands of NMMU students are expected to download the new mobile application – MyNMMU – freely available to most BlackBerry users, all Android smart phone users and iPhone users. The app is also aimed at the public with useful functions like NMMU maps, contact telephone numbers, career and programme choices and events. “This app is about convenience but more especially it’s about reducing our carbon footprint by reducing paper printouts and unnecessary travel,” says NMMU’s senior system engineer of blended learning Shaun Meyer. The introduction of the mobile application, as a follow-up to NMMU’s MyJourney app sharing career and study options for prospective students, is one of umpteen technology projects to have been implemented by the university’s ICT Services. The app has received high praise from those who have “test run” the product in terms of its functionality. Apart from the “anonymous” section of the app (for non-students and staff), there is built-in authentification (login) which offers users personalised tools and information about timetables, graduation, library catalogues, exam results, account balances, internet usage, adverts and for staff, features like class lists and teaching modules. “The app has been designed for ease of use, focusing on useful information and services that can be packaged to enhance working, teaching and learning. We’re confident that staff, students and visitors will find MyNMMU a useful tool,” says Shaun. 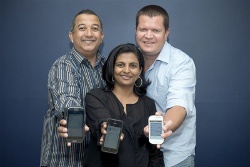 In conjunction with this app, NMMU has also launched a mobile website. Visitors browsing to www.nmmu.ac.za from a small device, will now be prompted to either view the easily navigable and lite mobile site or the full website. The university now has mobile versions of the staff and student portals, Moodle (eLearning site), My Journey (to search for careers or qualifications) and the main public site.